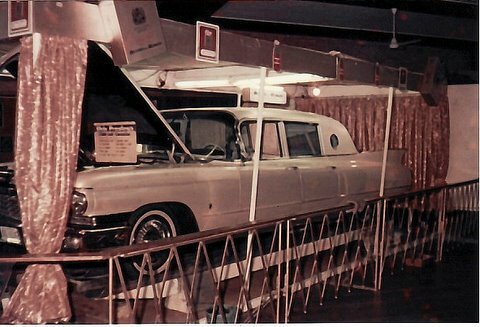 Australasian Elvis fans never got to see Elvis on their sunny shores but in 1968-69 they did get to see a piece of Elvis history when his 1960 Series 75 Fleetwood Limousine went on display across Australia and New Zealand. There is a famous 1962 Aussie pop song by Lucky Starr called I’ve Been Everywhere. 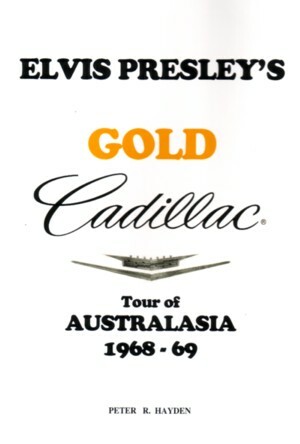 In the case of the tour “downunder” of Elvis’s famous GOLD Cadillac this title is very apt! Between January 17, 1968 and January 1969 the vehicle made almost 50 stops as it visited every Australian State and Territory (except the Northern Territory) before crossing the Tasman Sea to New Zealand where the very successful tour ended in July 1969. From Rockhampton in northern Queensland to Hobart, Tasmania and Perth in the west, Elvis fans did not have far to go to catch a first hand glimpse of a rather famous Elvis vehicle. Elvis historian and noted Australian Elvis collector and noted historian, Bob Hayden, recently released his booklet, Elvis Presley’s GOLD Cadillac Tour of AUSTRALASIA 1968-69. Captured with the 58 pages of Hayden’s booklet is a vivid historical record of the tour. With rare archival photos and press clippings the booklet is an important record of a little known art of Elvis history. During the Tour, the GOLD Cadillac travelled 17,000 miles and was seen in major cities as well as towns of only a few thousand people. The photos in the booklet include many very rare visuals of the GOLD Cadillac (sadly in black & white, the photographic standard of the time) in various locations and various archival images including Elvis sparring with Australia’s then World Bantamweight Boxing Champion, Lionel Rose. They are rare images and there many of them! With valuable contributions from many of Australia’s leading Elvis collectors, Hayden has been able to research and produce a comprehensive and fascinating account of the story behind the GOLD Cadillac tour. Short accounts of the car’s stops along the way from Kempsey in New South Wales to Devonport, Tasmania and the nation’s capital, Canberra, the narrative gives the reader a full appreciation of the time. From a charity screening of Clambake in Sydney and its unveiling in Canberra by the American Charge D’Affaires, Mr Ed Cronk, the sense of history, moment and excitement is nicely preserved in the booklet. Aussie tour souvenirs and gold records. There are also many fascinating pieces of information such as the tour was first announced in the Australian press in October 1965 with the headline "The Car is Coming!" A portion of proceeds from the sale of the booklet are being donated to the Benevolent Society. In this regard, Hayden records, the Tour was a huge success and raised nearly $150,000.00 for charity (a massive sum in 1969). Tour Manager Roy Darling, in show business circles since 1917 would report that he had never seen bigger queues than those lined up to see Elvis Presley’s car. Verdict: Bob Hayden’s account of the Australasian Tour of Elvis’s GOLD Cadillac is a welcome and important historic record of a little known part of the Elvis story which will be enjoyed by both Elvis historians and ordinary fans. Barbara Garton, USA: Great book! Seldom do we have the opportunity to read about Elvis and see pictures that we haven't encountered before. This was quite a treat!! Very well done and well researched. Mr. Hayden did a fabulous job!! I have gone through the book twice and enjoyed it very much. Jim McRae: Enjoyed your review of this great book which took me back to 68 when i saw the Gold Car at the Royal Easter Show. Unfortuneately i did not take any pictures but this book brought it all back. This is a great account of the tour and i must congratulate Bob on this great read.Thanks for bringing it all back and i look forward to your next book. Man, he had regrets!? I saw this car when it came to Christchurch NZ. I was working for a local photographer at the time and I also belonged to the local Elvis fan club. I went along to Hutchinson Motors where it was on display and took many pic of my fellow fan club friends standing in front of the car and, in some cases, sitting in it . I even got to sit in it myself . My biggest regret was that with all that was going on I never got to have my pic taken in the car or even standing by it . I've lost touch with those people over the years, so I haven't even got proof that I took pics of it . Oh well, at least I have the memory of that day. Ian B. Allen: I agree with your assessment of Bob Hayden’s valuable contribution to Elvis history. Both the information in text form and the photographs of the gold Cadillac tour are a real treat. Keep up the great work Bob!